I’ve seen an inordinate number of Mia Wasikowska movies, which is odd a) because she isn’t that huge a star, and 2) because I don’t actually like her that much. But she’s got an it-factor, there’s no denying that, her filmography and the amount that I’ve (partially unwillingly) seen her prove that. Defiance, The Kids Are All Right, Alice in Wonderland, Jane Eyre, Albert Nobbs, Lawless, Tracks, The Double, Madame Bovary; and there are more that I haven’t seen, like Stoker, Only Lovers Left Alive, Maps to the Stars. She’s everywhere, this young talent, and although I don’t care for her in everything, she has surprised me a time or two. So I guess I’d better give credit where credit is due and call Wasikowska an under-the-radar threat, even if Crimson Peak isn’t her shining moment. When Edith’s mother passed, the young girl was visited by her spirit, receiving a warning to beware Crimson Peak. Years later and now a part of New York high society, Edith still believes that ghosts are real, that they can be tied to a place or an event that still haunts them, in a strange twist of the usual sense of the word. When Edith meets and falls in love with Baronet Thomas Sharpe, she leaves her home to travel with him to Victorian England. Living there with Thomas’ sister Lucille, Edith slowly learns about the dreadful place; its red clay foundation, its fall into disrepair, its nightly noises, and its sinister atmosphere that seems brought on by a secret past. When she learns that the estate’s nickname is Crimson Peak, Edith knows that she’s in for trouble, both from the living and the dead. I was ultimately disappointed by this film, only because the first half was so strong. Wasikowska is the perfect breathy period heroine, Hiddleston the epitome of English grace with a subtle darkness. The pair of them were spectacular early on, as was the story crafted by del Toro, a play on the classic ghost story but with his vision of what that should entail. Even after the set up was over and the characters had moved to England, I was still confident in the movie. That is, until Chastain took on a major role. I don’t understand how other critics can’t see it; she’s a terrible actress and a detriment to every film she appears in. She began ruining the mounting pressure with her increased presence, and, along with Charlie Hunnam, cheapened was was working itself up to be an incredible bit of sadistic savagery. Del Toro dropped the ball as well, letting the end of the movie phone itself in, falling back on standard practices that have become ancient with use, and giving too much power to Chastain’s character. But she still deserves the majority of the blame, and I’m tired of her appearances ruining so much so often (Interstellar, The Martian). 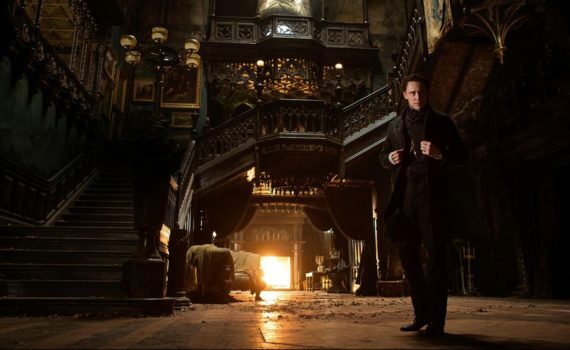 Crimson Peak is a good thing gone bad, or more accurately, a potentially wonderful thing gone shockingly wrong. Watch it if you like Gothic horror, but try to get as invested as possible early on, because by the end you’ll need to be forgiving.